Easter is a great time in the Christian calendar, it is an opportunity to really focus on the amazing sacrifice that Jesus made for us, and what he achieved through it. This page highlights some of the best free Christian resources for Easter. Whether you are after photos, clip art or a devotion you’ll find something here. For the most recent Easter posts, or to view them all you can go to the recent Easter post section. Find the best Easter sermons from classic sermons through to current preachers. A fantastic and challenging Lenten devotion for 2009 & 2008. Find a great selection of pictures based around themes of Easter. 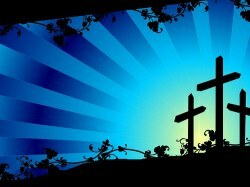 The best places to find free Christian Easter clip art. The main verses on Easter (from the old and new testament). A collction of websites to help you find the best free Easter cards. Here is a powerful clip from the Passion of Christ, that brings home some of the sacrifice that Jesus made for us.